For now, let’s get back to the measurements. Several tools can be found on the Internet that perform technical tests on DNS servers. In practice, however, almost every domain has more than one DNS server, so the results of the partial tests need to be combined. Only then, based on the combined evaluation of all authoritative servers, can the overall impact on the users accessing the domain be deduced. The whole issue is further complicated by the fact that some domains have already stopped working, for reasons unrelated to the planned change. Such domains would distort our statistics, so we need to identify them and instead of the total number of non-functional domains, work with an increment. For this purpose, CZ.NIC Labs developed their own domain scanning and evaluation tool, which calculates the overall status of the domain from the partial test results. The process of collecting and evaluating data is described in detail in the methodology. Let’s look at the results! The measurements made between January 11 and 14 show that only 0.12% of all domains in the .CZ registry are not ready. This chart shows improvements after the first CSNOG conference in June 2018, when we first presented the results of our measurements to the professional public. In September 2018, we once again called attention to the issue on our blog with the article “How to survive scheduled DNS maintenance,” which was taken over by other professional and general public media. Since November 2018, we have been contacting the technical administrators of unprepared domains directly. The administrators of the remaining 0.12% of domains have not yet responded to any of our attempts to reach them, and it is therefore not clear whether they just postponed the preparation to the last minute or chose to ignore the problem. However, a large proportion of domains randomly selected from this number appears to be unused and is only “parked”, so the impact on ordinary users should be very small. If you want to be 100% sure that your domain is ready, use the web tool at dnsflagday.net; you’ll find its description in the article How to survive scheduled DNS maintenance. Finally, let me thank all those who took the pains to get their domains ready and thus contributed to the good health of the .CZ domain! 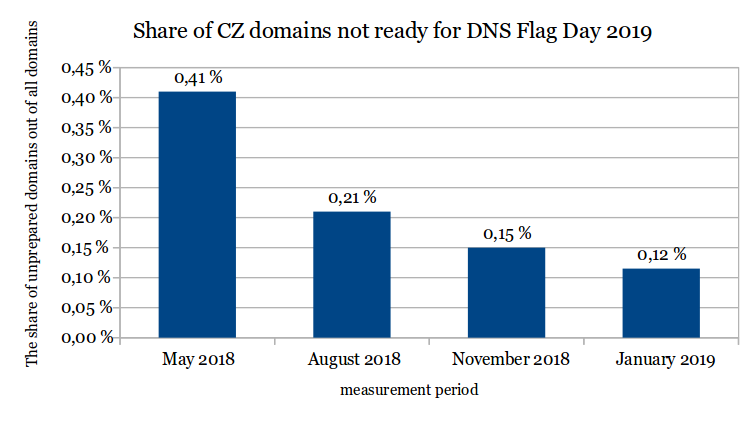 Update, 1st February 2019: According to the last measurement that ended the night of January 31 of this year, only 0.03 percent of .CZ domains will not work properly.